Depending upon where in Greece you might come from, you may have different Vasilopita baking traditions and recipes. 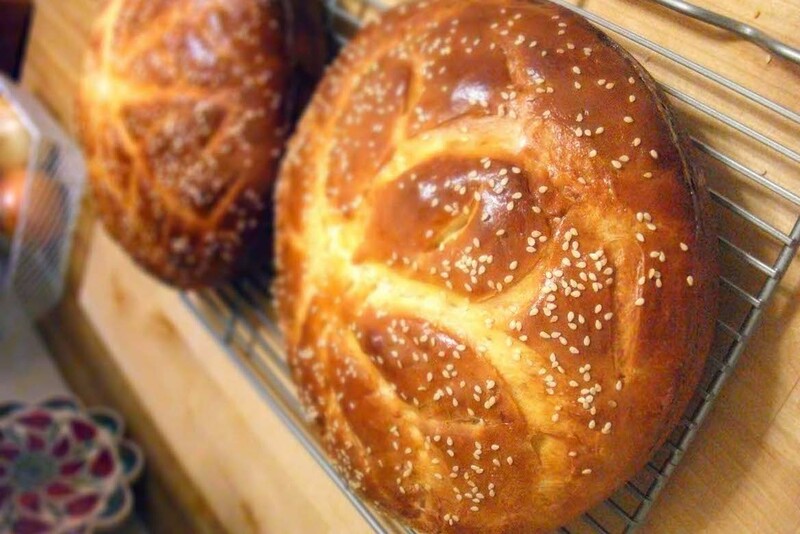 There is the cake version, which is prevalent on many Greek islands and in communities with descendants from Smyrna and Asia Minor, and there is the bread version, which is a variation of the Easter tsoureki. It seems most people these days opt for the citrus-infused cake version, although most church communities and organizations that host their “Vasilopita Cutting” celebrations usually make breads. Below is a tried and tested recipe for simple Vasilopita bread. *Note: some people prefer a more orange-flavored cake and double the orange zest, while another option is to add lemon zest to the mixture along with the orange zest. Dissolve yeast in 1/4 Cup of the milk. Add remainder of milk, eggs, orange rind and sugar. Sift 3 Cups flour, salt and spice into a warm bowl and make a well in the center. Pour in yeast mixture and stir to blend in flour, gradually adding warm melted butter. Mix dough with hands until it comes away from sides. Turn on to a floured surface and knead until smooth and elastic, adding remaining flour as required. Knead for 10 minutes. Place ball of dough in a clean bowl brushed with melted butter. Turn dough over to coat top with butter and cover bowl with a cloth or plastic wrap. Leave to prove (rise) in a warm place until doubled in bulk. Punch down and turn on to lightly floured surface. Knead lightly and shape into a round loaf. Place on a large greased baking sheet or in a greased 25 cm (10 inch) deep cake pan. Cover and let rise in a warm place until doubled – about 1 1/2 to 2 hours. Glaze with well-beaten egg and arrange blanched almonds in numbers to denote the New Year, pressing in lightly. Bake in a moderately hot oven (350 degrees F.) for 45 minutes until golden brown and cooked when tested. If bread browns too quickly place a piece of greased brown paper on top. Cool on a wire rack. Where can you get Masticha? Is it possible here in the USA or do I need to stick up in Greece? Where in Greece can I get it? Evharisto poli! Any local Greek store sells it. It says to “see note” when you listed the masticha. What’s the note? I didn’t see it. Thank you! Eleni hi– The original note just said to make sure Masticha was ground to a powder and mixed well because its flavor is strong and must be evenly distributed when the other spices are mixed. Happy New Year!